Blog of Sara (Butcher) Burrier :: Sara B Illustration: THANK YOU! 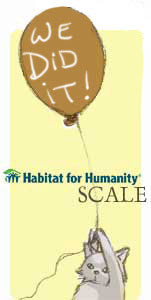 Today, with your help, $100 was donated to the Habitat for Humanity! THANK YOU! We helped families by giving to a foundation that builds homes. And now, we will help the other families out there that we share this planet with. As I had said when I started the fundraiser for Habitat, I am motivated and driven to give to wherever the money is needed through my work and through your generosity. After the goal is reached for each, a new one will be presented. You have proved through your support that this is a very obtainable goal. The next foundation is the World Wildlife Fund. One of my biggest passions is for animals. My mom was an activist for animal rights as I grew up, donating her time to the Animal Rescue League, and always having rescue animals in our home, many rescue animals. We raised money for our fellow neighbors, now let's raise money for the animals God asked us to take care of. How does the WWF rescue animals? By rescuing the land they live on. Like Habitat, every sale of an original painting, no matter it's size, 10% of the total will go towards WWF. This time around I am also including commissioned work. Any original painting, requested or bought from Etsy will be a donation on your part. I grew up with the WWF panda sticker on our front door, and I used to wear a sweater that had their logo. Now it's time to bring that full circle. Read more about the WWF and what they do at their site.